Making a profit in multiple retailing is the result of effectively managing constraints such as space, and controlling variable elements such as Cost of Goods Sold. Measurements of success in Merchandising range from simple measures such as like for like sales increase to more useful and meaningful measures like margin %, markdown value and stock turn. If we want to get a truly accurate measurement of profitability we need to look at Direct Product Profitability where both the variable and fixed costs of the retailer are assigned to individual products. This, though, is a major undertaking and is too complex for many retailers. As with most areas of retail there is a trade off here between effort and efficiency, and there is a middle way that can provide valuable insight. This middle way is based on a performance measurement index called Gross Margin Return on Investment and Space (G.M.R.O.I.S. ), which is in turn based on two other measures – G.M.R.O.I and Display Density. Let’s look at these components individually before seeing how we can put them together. Many of you will be familiar with the concept of Gross Margin Return on Investment (G.M.R.O.I). Most retailers use the performance indicators of Gross Margin % and Weeks Cover to measure performance. These are very commonly available, but used in isolation from each other they are of limited value. Gross Margin % gives us a measure of relative profitability without taking into account the costs of stockholding investment. Weeks Cover tells us how effectively we turned our stock without informing us about relative profitability. G.M.R.O.I. provides a measure that combines these two indicators in a synergistic way into something much more powerful. Product Group C has the same Gross Margin and the same Stock Turn as Product Group B, but is driving through only half the sales value. Simple Gross Margin measurement would indicate that the Product Group A was a better investment. GMROI shows us a fuller picture and tells us that Product Groups B and C provided an equal return on the cash invested in stock. It would, however be wrong to assume that this is the end of the story. To get closer to an accurate analysis of the true profitability of these products we need to dig a little deeper. For nearly all retailers space is the most important constraint in their entire business, and effective management of the amount of space given to a product or to a product group is one of the key determinants of success. Let’s develop our example a little further. Let’s keep looking at the same three product groups. They are all given the same amount of space – 20 space units. It doesn’t matter for these purposes which measure of space you use as long as you are consistent. Let’s assume here that we are talking of linear feet. We now need to incorporate a measure that tells us how effectively this space is used. Some retailers use a measure called G.M.R.O.F. (Gross Margin Return on Footage) here, but this is of limited value as it only describes the relationship between the margin value and the space, and takes no account of sales volume or stock investment. What we need to do here is to establish a relationship between space and the average value of Inventory at Cost. We use the Average Inventory at Cost as the key measure here because it is the “investment” referred to in the preceding G.M.R.O.I. calculation. To do this we simply divide the average stock at cost by the selling space to give us a new measure called Display Density at Cost as shown in the example below. 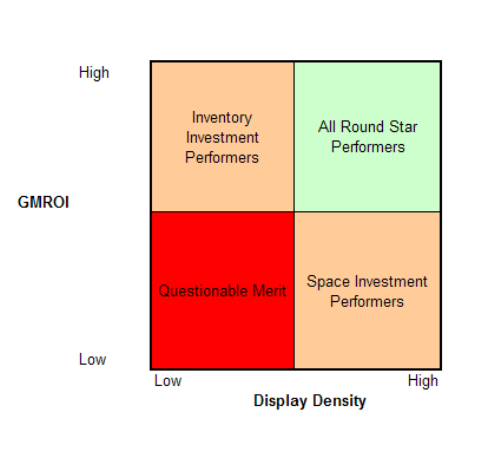 The final part of the equation is to combine the GMROI and the Display Density to create Gross Margin Return on Space. As you will see from the example above the three products have exactly the same G.M.R.O.I. but they have very different display requirements. Product Group A can fit nearly three times the value of stock at cost into the same footage as Product Group C, and four times the number of units. You will remember that G.M.R.O.I. was telling us how many times we got each pound invested in stock returned as profit. G.M.R.O.I.S. takes this further by taking into account the effective use of space. The differences are striking when we look at this graphically. If we imagine that we are trying to squeeze profit out through a pipe, we can look at G.M.R.O.I. as the pressure applied to the contents of the pipe and display density as the width or bore of the pipe. The higher the pressure and the wider the pipe, the more real profit in the form of G.M.R.O.I.S. can be squeezed through. There are four broad outcomes to any analysis of G.M.R.O.I.S. as shown in the matrix below. Firstly we have those product areas that have high G.M.R.O.I. and high Display Density. These are your star performers having the highest G.M.R.O.I.S. and you should consider developing these product areas. This development may involve increasing available stock at cost and potentially increasing the space allocated in store. You might also consider increasing margin percentage by raising average retail prices. Next we have the intermediate performers where they score highly on one measure but less so on the other. In the case of high G.M.R.O.I. but less effective use of space, we need to look at the causal factors. For example, products with very low cover and high gross margin will probably have experienced stock outs and fragmentation of ranges, and were therefore not fully exploited in terms of their ability to generate profit. This combination is characteristic of products with a relatively high G.M.R.O.I., and it might make sense to increase the stock support for this area. This of course may further reduce the display density, so it would also make sense to review packaging and display methods in these areas at the same time to maximise the utilisation of space. Given that space is a finite resource, any increase in space would have to be at the expense of the low G.M.R.O.I. and low Display Density product areas. Turning to low G.M.R.O.I. high Display Density products, these tend to be products where margins are low. These are sometimes low margin products that may be loss leaders or key value lines which are necessary to drive footfall whilst still making effective use of the available space. Care should be taken not to reduce sales of other products by reducing or deleting these without due care. Where the low G.M.R.O.I. is caused by high cover resulting in very slow stock turn these products may qualify to be deletion candidates. The final category – those products with low G.M.R.O.I. and low Display Density are your “dogs”. They use up a disproportionate amount of your retail space without making a significant contribution to your profit given the investment that you make in stock and space. These product areas are clearly candidates for deletion, although we must of course recognise that the issue is not black and white. There are some product areas that retailers simply have to carry to achieve overall range authority at the expense of the profitability and effective space utilisation of the particular product group. These principles can be applied to individual products or to product groups and at store or company total level. The decision as to what level to use is normally based on the availability of information and resources. If you are a grocery retailer you may well have modular stores with planograms that give you very detailed information on space utilisation at a product level. For fashion retailers it is highly unusual to see space measurement below a department by store level available to merchandisers. Finally, we have to recognise that for this measure to realise its value we have to be able to make people accountable for it and to reward them accordingly when performance targets are achieved. This in turn means that they have to have control over the principal levers – margins, stock levels and use of space. We also need to institute a set of processes that allow for a review of actual against planned performance and to have in place a suitable structure for taking action where significant variances are discovered. Without these, G.M.R.O.I.S. is still an interesting historic measure, but it will not help you in your tactical implementation of merchandising strategy. I received an email from Emily Hill at Home Depot in the USA. On the first reading of your article “Making Space for Profit,” you made a very compelling argument for GMROIS as a potential metric that we might consider in our assortment planning. As we further explored the concept, however, we found that GMROIS is nothing more than Total Gross Margin Dollars / Space Units, which is the same as GMROF. ….. My colleague and I came to that conclusion based on the following steps, in which we broke down each of the components of GMROIS. (4) Substituting (3) for GM% in (2), Part A becomes simply GM / COGS. (8) Finally, by making these substitutions and calculating GMROIS according to (1), you will get GMROIS = Gross Margin Dollars / Space Units, i.e. GMROF, because Average Inventory at Cost “cross-cancels” out of the equation. [NOTE – From John – For the sake of completeness and understanding, the Cost of Goods Sold also cross cancels and can be discarded]To validate this assumption, we used the same figures in your article and the GMROF calculation was the same as GMROIS (GMROF for Product Group A = 54, B = 40, and C = 20). If this makes sense, would you suggest “GMROI / Space Units” as an alternate formula for GMROIS? Thank you again for your time and expertise. Really appreciate it! Having looked at this you are quite correct (and I am not a little surprised that I didn’t spot this myself) Introducing the density “felt” right, but as you noticed it is in fact cancelling out the stock part of the GMROI equation which is absolutely not what I was trying to do. It seems to me that you are right and that the answer is simply to calculate GMROI /Space. Your input is much appreciated and I will amend the article accordingly. If you multiply this version of GMROI by Display Density (i.e. Average Inventory at Cost / Space Units), you can see more quickly and clearly how the Average Inventory at Cost will cross-cancel out, leaving you with (Annualized GM / Space Units). One more thought: It might actually be better to multiply GMROI by (Shelf Space / Product Size), rather than simply dividing by Space. That way the tactical interpretations derived by comparing GMROI to Display Density will still make sense. Otherwise, you’d lose the element of the space constraint. I didn’t amend the article – I thought is was more amusing to show how easy it is to overcomplicate matters! I think Emily’s suggestion of multiplying GMROI by (Shelf Space / Product Size) takes us back to the same place though as the increase in space productivity (i.e. more units per space) in the same space results in a higher level of inventory and commensurately reduced stock turn and therefore reduced GMROI. Any further suggestions are of course welcome! !